Facebook Buy Prints here Reblog from Tumblr! Avengers!!!!!! That movie was stupid awesome my head exploded! I wanted to wait a bit before I put this up on the DA, because its kinda spoilers..? but it was up on Tumblr for a couple of days now. This was my favorite part of the whole movie. I saw it 3 times!! This line was so hard to hear through the people laughing and clapping. I might be doing a full on cool composition some time but I dont know yet. Anyway I hope you guys dig it! It seems like the "gods" are getting there butts kicked in this movie! i liked how hulk recated in that scene, and how he whooped some a$$ in the movie, and i liked how you've made the scene in this now. good work, sir, and p. funny! 1000 comment!! keep up the good work, Kenjie!! 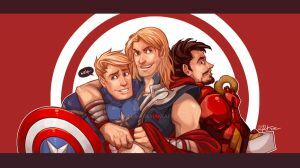 haha I love this and loved watching the avengers! I remember seeing this when my mom rented the movie. I rewound it twice, and fell off of the couch dying with laughter. I was like, "You really deserved that." In my head I was secrectly saying, "Aww poor baby, are you hurt? *Hugs"
From what I remember Loki's comment was actually "oowwwwwwww...."
no one likes a sore loser! Hulk is like a chubby sumo baby! OMG! O_O I want to hug little Loki! Even though I was sick, I watched this about a week ago and burst out laughing at this part xD I just love how he totally dominates Loki and you never see it coming. One of my favorite lines!! Haha I loved that scene. My sister watched it twice, and in the theater the second time, everyone started cheering when this happened. The ONLY thing You missed, in MY opinion, was the entire sequence that lead up to this! I can't stop from laughing to myself, AND, Out Louid when I remember What happened when Loki started lipping off to the Hulk: NOT A GOOD IDEA! I could barely stop laughing during this scene. I want it on Blueray now. ...Did he actually say "You guys are all stupid bullies"? when i saw it i was like "whats up with hulks chest hair"
Neeheehee... My stupid laugh. That was nearly my favorite part. I have to like the part were the Hulk punched Thor though. But anyway... SQUEE!